Sign up to get Austin's news and amazing deals delivered to your inbox. 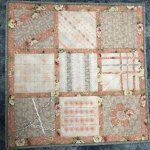 While making this fun wall hanging, you will create wonderful textured blocks, utilizing lots of different techniques and different presser feet on your Pfaff sewing machine. Each block will use different feet, stitches and materials to create beautiful texture and fun creations! The following list breaks down the feet you will need to create the finished wall hanging. Other Sewing Supplies needed will be shown in each block instructions. Fabric needed: The following is a list of all the fabric you will need for the full wall hanging. I have given yardage for you to purchase, but have also included, where applicable, the size needed as some can probably come from your stash of scraps. You will need to keep track of your fabrics, and I suggest making a cheat sheet as shown so you know what fabric is for what block. I used some old stickers I had on hand, to label the fabric scraps. Note the instructions referring to a typewriter! Do you think they might be a bit old? They still worked fine though, even though I didn’t use a typewriter! As you choose your fabrics, think of two complimentary colors. Mine were purple and blue. The blocks will be variations of one of the colors, and the framing strips the other. I used batiks and linen, but any quilting cottons will be good. Just be sure to keep the tone on tone look. Prints with lots of contrast will not allow your textured techniques to show. They would be good, however, for some parts, for example the flower, in the free motion block. I used different prints for each block. You can duplicate some, however it’s harder to keep track of them so the same prints are not next to one another in the finished wall hanging. The blocks are numbered in order from 1 to 8. They are not used in order in the wall hanging itself though. 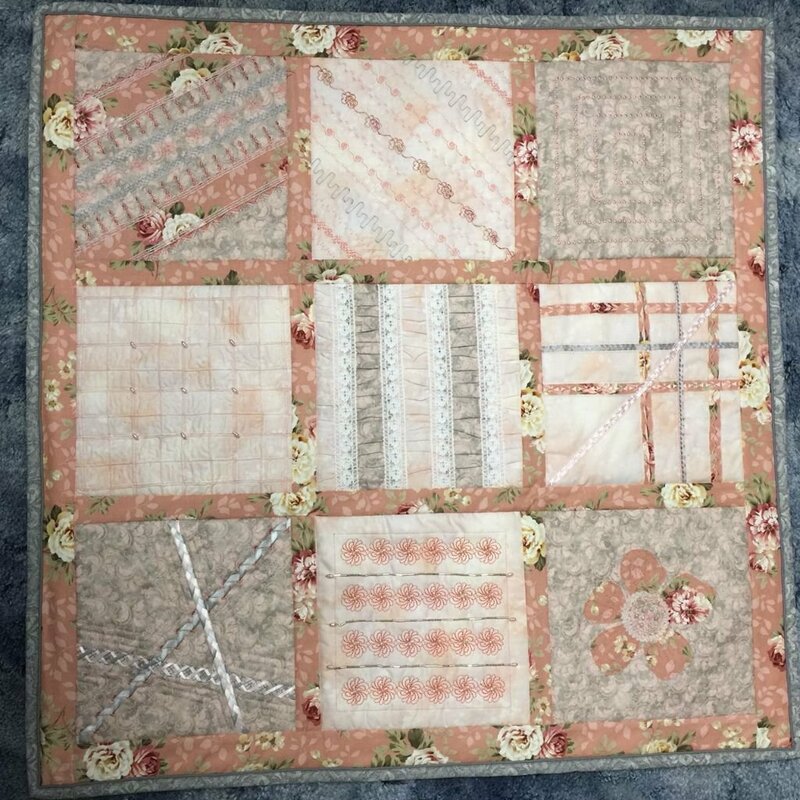 When you have all your blocks completed, then you want to lay them out and decide on the order. I talk much more about this in the “putting it all together” section! Requirements: You must have Creative Vision or newer top-of-the-line sewing and embroidery machine. Those with sewing only may choose to do a different block on the block that is embroidery. Instructor Bio: Annette has been teaching Pfaff software and Pfaff machine techniques for many years.